Good oral care is part of many people’s daily routine. However, only a fraction of people floss their teeth daily, a task that prevents serious dental conditions like periodontal disease. According to the National Institute of Dental and Craniofacial research, periodontal disease is the number one cause of tooth loss, making its prevention crucial in maintaining your smile. Find out more about periodontal disease symptoms and treatments with Dr. Jeffery Johnson and Dr. Jodi Johnson in St. Louis, MO. Periodontal, or gum, disease occurs when the gums become irritated and infected with bacteria. These bacteria begin growing on the teeth, fed by the carbohydrates and sugars in the foods you eat, then harden into a sticky white substance called plaque. 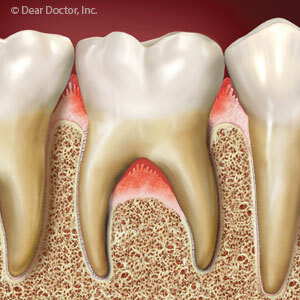 Plaque eventually hardens into tartar. The irritation in the gums causes pockets which form between the gum and the tooth, trapping bacteria and plaque, causing further irritation. Most cases of mild to moderate periodontal disease clear up with a professional teeth cleaning and continued flossing. However, other, more serious cases, may require a more in-depth periodontal cleaning. Very serious cases require flap surgery, which cleans the tooth all the way to the tip of its root. Consult with your dentist to determine the best course of treatment for your periodontal disease. For more information on periodontal disease, please contact Dr. Jeffery Johnson and Dr. Jodi Johnson in St. Louis, MO. Call (314) 427-7400 to schedule your appointment with your dentist today!